Instead of constantly deleting old and creating new interface elements every time the interface changed, I created a collection to keep deleted instances around and reuse them when I needed new ones. This can be done easily by simply keeping any kind of modifiable collection like a List (though I would recommend using a stack or queue for ease of access), where we keep deleted objects until we need them again. 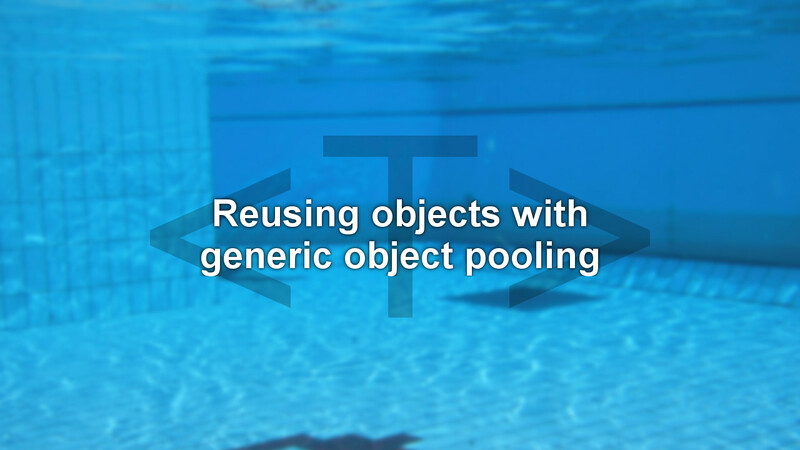 Today we will take a look at my implementation of a slightly more complex – yet easy to use – object pool that handles this behaviour for us – and does so for any number of different types, using generics. Foo<string>.Bar and Foo<bool>.Bar are two distinct static members that can hold different values. This means we can do the following. This class will create stacks in which we can hold our objects – exactly one for each of the types we use it for – with all the niceties of type-safety. Our object pool class needs essentially two functionalities: adding objects, and removing them. We implement them as follows. But, if we actually take a look at the code we have just written, using our system… it is sort of ugly, is it not? Is it really necessary to define the type of the object? Can we not make our system infer the type somehow, so we can write more succinct code? The key point here is that C# can infer the generic type of the methods – note how the methods themselves are now generic, instead of the class – and then accesses the correct generic class for us internally. Something else that bothers me above our first usage example is how when we try and pop an object from our pool, we need a conditional statement to check whether we actually gone one, and if not create a new object. We will have to write that code every time that we access our pool. This clearly screams for us to provide an automatic way of doing the same. True, we again have to specify the type in our method call, but we can now do with the ?? operator what we needed an if block for before. In fact, there is a special case in which we can make this even nicer: The case of parameterless constructors. Unfortunately C# does not provide us with the ability to define constructors in interfaces – something that could come in very handy for generic type constraints. However, there is one exception: We can specify in our method (or type) signature that we require our generic type to have a parameterless constructor. I dare say that this may be as concise as we can make our call. Not to mention that it very clearly communicates to the reader what the code in question does – while the multiple lines above (that did after all the exact same thing) might require a moment longer to understand. For completeness, here is the full code, with yet another small addition. Note how I used a simple lock in our two main methods to make this system entirely thread-safe as well. While I did not need that feature for the issue that prompted me to write it, it was almost trivial to add. I hope this has been interesting and potentially useful to you. Drop a comment below, if anything is unclear, or you have other questions. Also make sure to let me know if you use object pooling yourself, especially if you have written your own system for it. Also feel free to check out this follow up post where I explore how we can automate our object pooling using IDisposable and finalizers.